When you read about the failure of many marriages in the news, you might wonder whether there are even any successful marriages out there. 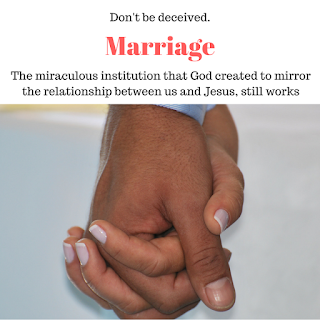 Don't be deceived! There are a lot of successful marriages out there. Not marriages that the partners are just barely accommodating but marriages that the partners are enjoying one another's company. You must believe that the Devil wants you to believe what you read in the tabloids and believe that there is no hope for marriages in this day and age. Understand this truth. The institution called Marriage was created by God to last a lifetime. And God created this institution to mirror the relationship between us and Jesus. Are we saying that we should stop having a relationship with Jesus because some people turn against Christ everyday? No! There are people who still have a wonderful relationship with Jesus Christ. And as well, there are people that have wonderful relationships in their marriages. Yes, marriages may have ups and downs. But never give up. Don't take the easy way out by seeking for a divorce. Stand firm in the fact that God created marriage to last a lifetime. God is not a joker. Just get into marriage with the right spirit, attitude and belief. Also I say, Stay in your marriage with the right spirit, attitude and belief. Know that your marriage cannot work with acknowledging the creator of this institution, GOD. Believe this! A vast majority of marriages last a lifetime. Dear Lord, give us the courage and hope we need, for the rich and beautiful marriage you want for us. Help us to work out our marriage holding on to those biblical truths about out marriage. Give us the grace to live successful lives and be examples of the relationship between Christ and the Church. Amen.